Montana's favorite NFL team is...the Jaguars? Infographics are usually the best summation of how we share content here on the World Wide Web. They’re bright and shiny, they present information in very clear ways, they’re easy to digest, and there’s no way to confirm if they’re actually true or not, but we kinda don’t care anyway. 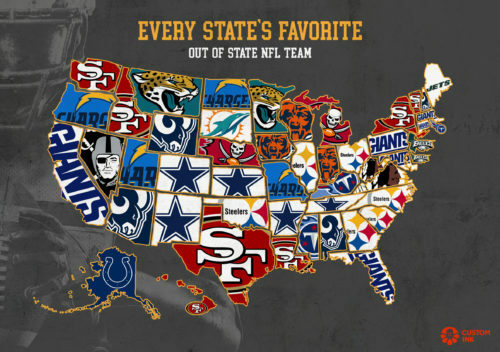 Such is the case with a graphic and study presented by Custom Ink, which apparently analyzed Google search interest data for every NFL team in order to figure out the favorite out-of-state team in each state. So in the case of California, it’s not about determining how many Rams, Chargers, Niners, and Raiders there are, but figuring out which non-California team has the most fans in the state. The results are…questionable. Per their study, the San Francisco 49ers are still riding a wave of national fandom from their 80s and 90s glory days, coming up as the top non-local team in seven states. They’re followed in popularity by the Pittsburgh Steelers and New York Giants, who both show up six times. In general, the list seems to imply that “classic” NFL franchises are more likely to be among the most-appreciated rather than more recent powerhouses, like the New England Patriots or Seattle Seahawks. Look, they pulled the data and crunched the numbers, but this all seems like a bunch of horseshit. First of all, it doesn’t make any sense when it comes to a lot of states that don’t have NFL teams. Presumably, the study considers the New England Patriots as the “in-state” team for all of New England, but that’s dumb and defeats the purpose of the study. There’s no way the most popular NFL team outside of New Hampshire isn’t the Patriots and there’s no way the most popular team out of South Carolina isn’t the Panthers. Also, if that is the scenario they used, then letting the Raiders be the top out-of-state team in Nevada is one hell of a cheat. That’s literally going to be their home state in two years (maybe one?). And you’re really going to sit there and try to tell me the Jacksonville Jaguars are Montana’s favorite NFL team? How do you let this thing go out the door? Let’s take Illinois as well. According to this study, there are more Pittsburgh Steelers fans here than, say, Green Bay Packers or Minnesota Vikings fans, which is insane. The Midwest doesn’t work like that. Obviously, this is the point. This kind of infographic doesn’t exist to be “correct.” It exists to get people like me ranting about how dumb it is. Well, mission accomplished. Now if you’ll excuse me, I’m putting all my money into a Jaguars-themed bar in Helena. I’ll be rich, suckers. 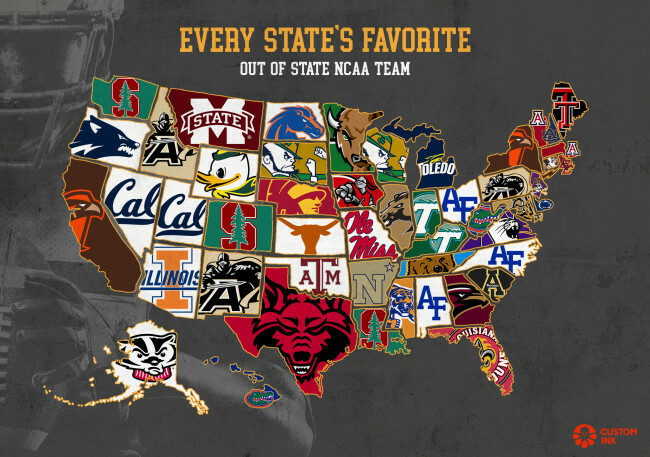 Bowling Green is New York’s most popular out-of-state college football program? Really? REALLY? R.E.A.L.L.Y. ?